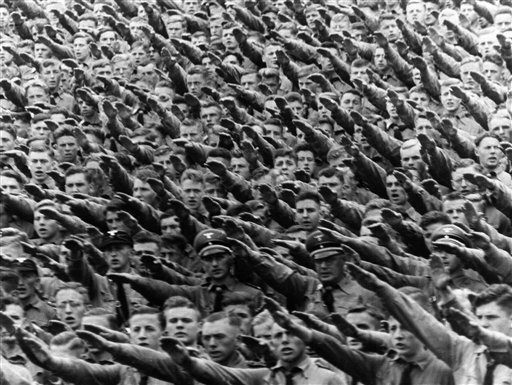 August Landmesser was a fairly ordinary German who wound up famous for something that he did not do. However, by not doing it, he actually made a powerful statement that reverberates over time. 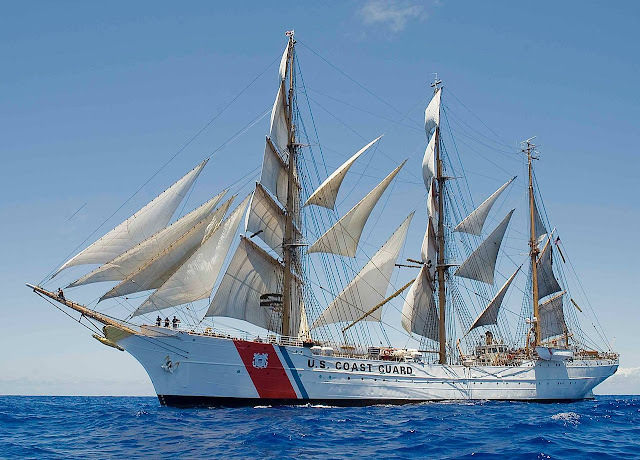 The Horst Wessel, later renamed the US Coast Guard Cutter Eagle. It was taken by the United States as war reparations and remains in service today. Landmesser was a loyal NSDAP type who joined the Party in 1931 - before Hitler took power. By joining so early, he was an early adopter of the party and thus could be considered an enthusiastic supporter. However, that did not last long. Landmesser was an ordinary laborer who worked at a shipyard, Blohm + Voss, in Hamburg. 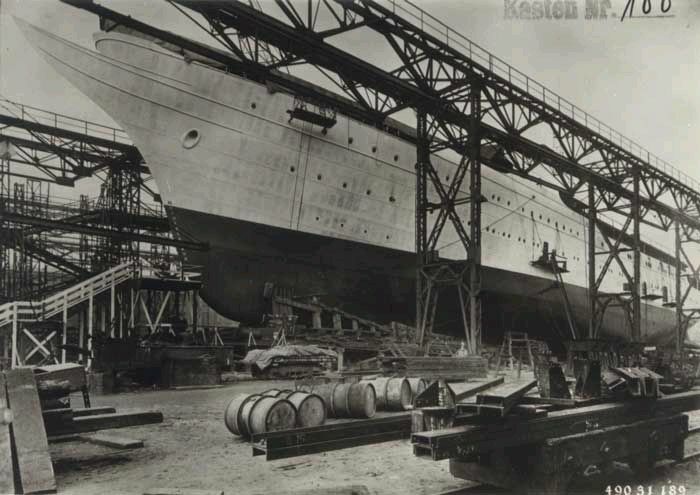 Blohm + Voss eventually built some of the biggest Kriegsmarine vessels, including the Bismarck and the Tirpitz. On June 13, 1936, Landmesser attended the launching of the training vessel "Horst Wessel." Ship launchings in the Thirde Reich were rallying points at which Adolf Hitler himself would appear and give a speech. Landmesser was captured in a photo not saluting Hitler with the customary stiff-armed Fuhrer salute. Why he refused is a microcosm of how large events can affect ordinary people. Hitler Youth giving the Hitler salute. Notice that everyone is participating. Not participating meant that you were noticed. You didn't want to be noticed that way if you wished to continue a normal life. To backtrack a bit, during the early 1930s, Landmesser began dating Irma Eckler. She was Jewish, so this raised problems in the Third Reich. He proposed marriage to her in 1935, but this violated the new Nuremberg racial laws, the application was denied, and he was expelled from the Party. They had a daughter, Ingrid, in October 1935. The Germans didn't change their minds, so in 1937 Landmesser attempted to flee Germany to Denmark with his family. He was detained at the border and charged with "dishonoring the race," or "racial infamy," under the Nuremberg Laws. A year later, Landmesser was acquitted for a lack of evidence, but was instructed to not have a relationship with Eckler. Landmesser ignored this order and was arrested again in 1938. 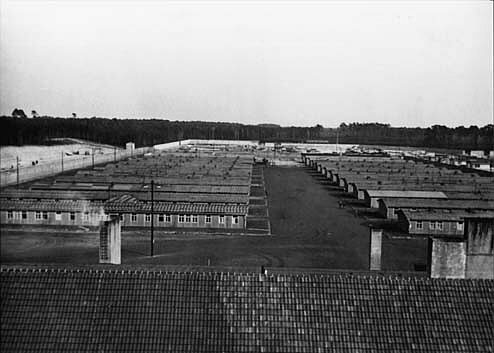 This time, he was sentenced to nearly three years in a concentration camp. At the same time (18 July 1938), the Gestapo also arrested Eckler, who was several months pregnant with the couple's second daughter. 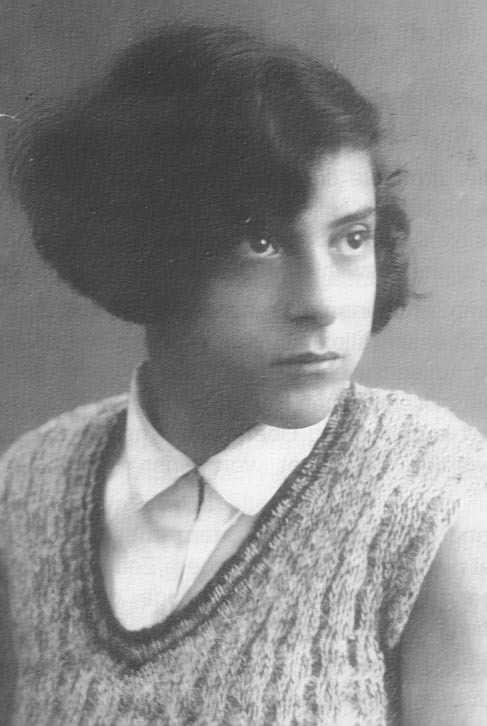 She gave birth to second daughter Irene in prison (Lichtenburg, near Prettin on the Elbe (District of Torgau)) and was sent to an all-women's concentration camp (FKL Ravensbrück) soon after her delivery. She is believed to have been transferred to a euthanasia center in 1942, where she died with 14,000 others. Landmesser was discharged from prison on 19 January 1941, and he then got a job as a foreman for the haulage company Püst at the Heinkel-Werke (factory) in Warnemünde. 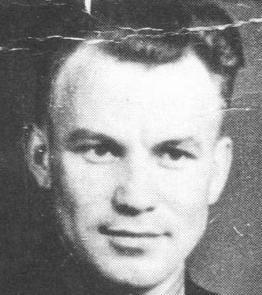 In February 1944, the Germans, short of soldiers, drafted him into a penal battalion, the 999th Fort Infantry Battalion. One can imagine he was not an enthusiastic soldier, but he had little choice. Landmesser was declared missing in action, after being killed during fighting in Croatia on 17 October 1944, as the Wehrmacht troops became swamped by Soviet advances "in the direction of Belgrade." 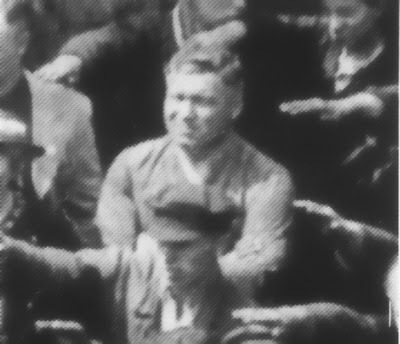 Like Eckler, Landmesser was legally declared dead in 1949. 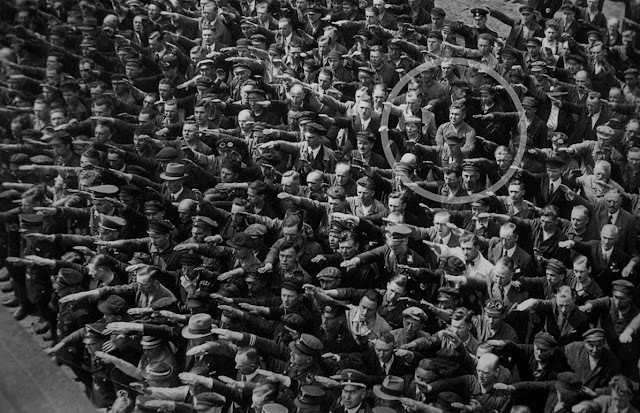 August Landmesser remains a hero to non-conformists to this day, and if anything his fame has grown in recent years. It has come to my attention that the man in the photograph may be someone else and not Herr Landmesser. That candidate is Wegert Gustav, who also did work at the shipyard and who objected to the Third Reich on grounds of his Christian faith. Mr. Gustav died in 1959. Naturally, those who think that it was Herr Landmesser believe they have an airtight case, and those who think it was Herr Gustav believe that they have a better case, complete with a very close physical resemblance of the man/men (particularly the hair) and the fact that there is no proof that Landmesser actually worked at the shipyard in 1936. Parenthetically, let me state that there is a lot of, shall we say, "revisionism" or "slanting" of details about this and that from World War II, done for purposes of an agenda. What that agenda might be in this case I shall leave to your imagination. I know what you're thinking: "I don't care who it really was and I don't need multiple theories because they are all dead and it doesn't really matter now anyway, so just tell me the story that everybody believes and leave it be." Well, that story is above. But the man, whoever he was, deserves his due, so I provide this alternate possibility and let those who care decide for themselves. The principals can all look down from Heaven and sort it out if it matters. Most likely, you can simply glance at the pictures and cut the proverbial Gordian knot and "know the obvious answer." I marvel at your abilities. 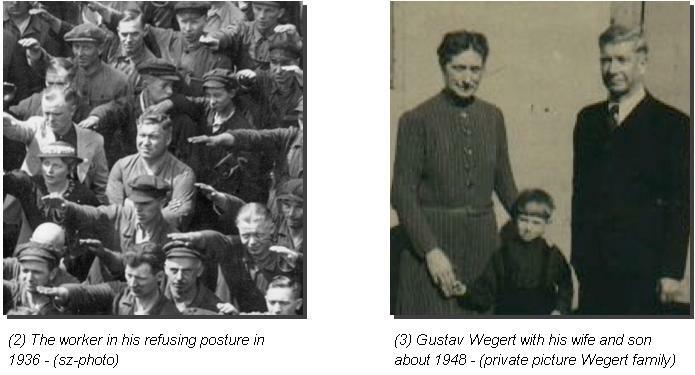 I have no problem dwelling upon a possibly false connection such as Landmesser's because, quite frankly, I find his story of interest as the travails of an ordinary man in Hitler's Germany regardless of whether he actually was the one who "didn't salute." August was originally identified by his daughter, Irene Eckler, many years after the war. The controversy over the identity arose only later. I am reminded of the bad joke about Homer, of whom it is said that if it wasn't actually Homer who wrote "The Odyssey," then it was just some other blind storyteller from ancient Greece. Anyway, I do not know the true ID. The two fellows look remarkably similar. It does not really matter at this distance imho, but you may feel differently. There was a man. He did not salute. That is what matters.